American Institute of Healthcare & Technology (AIHT) is committed to providing traditional learning environment that encourages high expectations for each individual’s success in various healthcare careers. Our dedication is to assure educational experiences that will assist our students in achieving their greatest potential to adapt and excel in diverse and ever changing healthcare fields. AIHT exists to advance individuals in their medical career path of choice. Not only do we offer a variety of different healthcare programs at various different lengths, we also offer an outstanding education that enables students to contribute to their communities in meaningful and positive ways. The first step to getting your career started is visiting AIHT’S Admission Department. 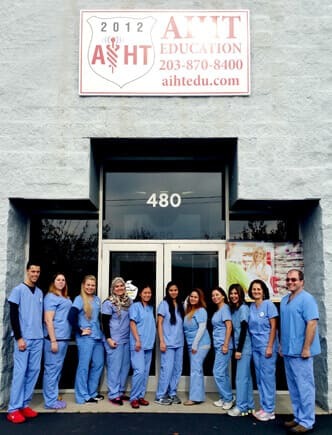 Our friendly and knowledgeable counselors will help you get acquainted with AIHT and our professors, discuss our training programs and answer any and all questions you may have. We realize how important it is to select the right career at the right school. Our counselors will advise you through the entire admission process including financial assistance.